House of Fraser bags are “Coming For You” this Christmas! Colourful, bright and extremely fun, the new House of Fraser Christmas packaging has been developed to spread cheer and happiness this festive season. 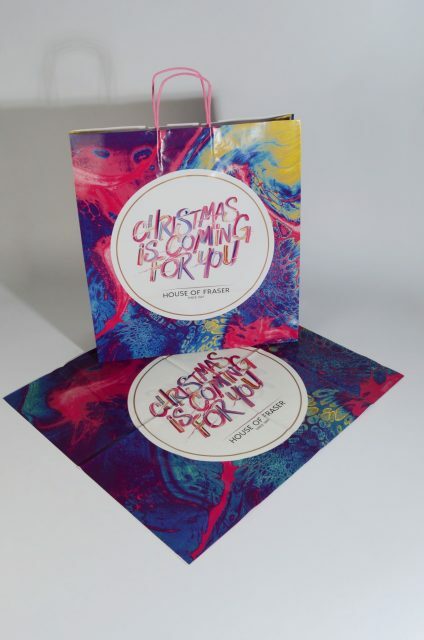 Produced by retail packaging supplier Keenpac, the bags jump out of the crowd with their marble design and slogan “Christmas is Coming for You” – it’s clear every shopper will want one! Keenpac has a long-established relationship with House of Fraser and has been supporting the brand with their packaging merchandise for over ten years, with the Christmas carrier bags being the latest project. House of Fraser’s successful Christmas campaign is already in full swing with its own television advertisement currently being aired. The advert sees Christmas creep up on a range of models and dancers, set to music from MOBO-nominated Laura Mvula and her unique sounding cover version of “Ready or Not”. To complement the campaign the new carrier bags had to resonate its messages whilst inviting shoppers to share in the experience and feel a part of the ‘party’. The bags were kept simple in terms of design with no added decorations or finishes, allowing the bold branding to speak for itself. The colour scheme for the Christmas packaging was developed around current market trends, incorporating bright colours and metallic, which echo in-store decorations. The slogan “Christmas is Coming For You” is built around the concept that whether you love or hate Christmas, there is no use resisting – the more you embrace it the more fun it is. It’s coming so embrace it! The paper bags have been produced from a clay coated paper which has a smooth surface. This helps to exaggerate the boldness of the colours and adds a slight gloss finish so that they sit well alongside the polythene bags of the same design. The paper bags have been developed in line with House of Frasers’ sustainability strategy, being produced from FSC certified paper with water based inks and are fully recyclable. The polythene bags contain up to 30% recycled content and are also fully recyclable.